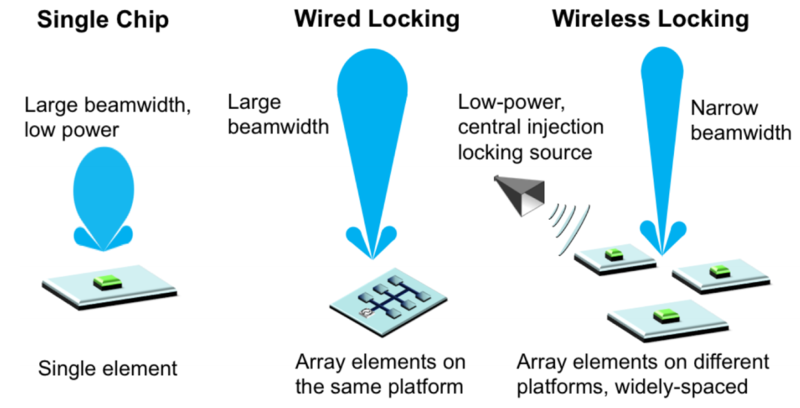 We implemented the first wireless synchronization of a mm-wave array, eliminating the need for connecting wires between the array elements. Wireless injection locking is successfully demonstrated and a 3dB bandwidth of 400Hz at a carrier frequency of 50GHz is achieved (frequency stability of 8ppb). The chip implemented by our team includes two on-chip antennas, a power amplifier, a phase-shifter, buffer amplifiers, and a VCO. The chip is fabricated in a 65nm CMOS process and occupies an area of 1.7mm x 3.8mm. C. Chen and A. Babakhani, “Wireless Synchronization of mm-wave Arrays in 65nm CMOS,” in IEEE CICC Symp. Dig. Papers, Sept. 2015. C. Chen and A. Babakhani, “Wireless Synchronization and Spatial Combining of Widely-Spaced mm-wave Arrays in 65nm CMOS,” submitted to IEEE Transactions on Microwave Theory and Techniques, 2016.